The first movement (Allegro) is based on sonata form. The first subject is built upon the interval of a fifth; the intervals of a third and fourth are the principal elements of the second subject. The main idea is developed and leads into a Ländler which links up with the recapitulation. The movement ends with a short coda. In the second movement the arioso sections are connected by contrapuntally-formed 'bridges'. An 'Abgesang' with ostinato figures leads to a calming finish. In the final Presto, a Rondo, dance-like passages with many changes of metre oppose chorale-like sections. A waltz episode appears twice as a third element. Following a short adagio interlude, a short coda concludes this lively round dance. The dynamic marking of the solo part should be seen in relation to the piano part and the volume balanced accordingly. In 1987 he composed the Sonata Brevis for Mirjam, his granddaughter. 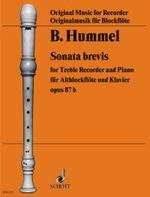 Set for treble recorder and piano, the piece offers an abundance of rhythmic and contrapuntal elegance. Each of the three movements captures the listener's attention with exciting structures and non-conuentional twists and turns. The use of interval bricks, elements of folk-music, glissandi, flutter-tongue technique, and contrapunctal bridges will satisfy each listener's curiosity. Replete with lively sections with dance characters and mang rhythmical changes, waltzes, choral insertions-even an abyesany leading to a short coda-make this a very compelling selection.